1956 Melbourne Olympics complete set of 52 special pictorial postmarks, on official illustrated Souvenir covers and each stamped with 4d Melbourne Olympics, plus several duplicate covers stamped with Melbourne Olympics set. Also selection of 43 First Flight and miscellaneous covers including 1958 Qantas round the world (12), 1959 Qantas Australia to United States (1) and intermediates (4) and 1959 BOAC England to Australia (2), Australia to England (2) and intermediates (4). Odd minor blemish. Accumulation of 432 Australia Post First Day and souvenir covers from 1956 to 1993, including many cancelled with special or commemorative postmarks, plus asmall range of Foreign covers. Many covers with marked backs caused by photo album. 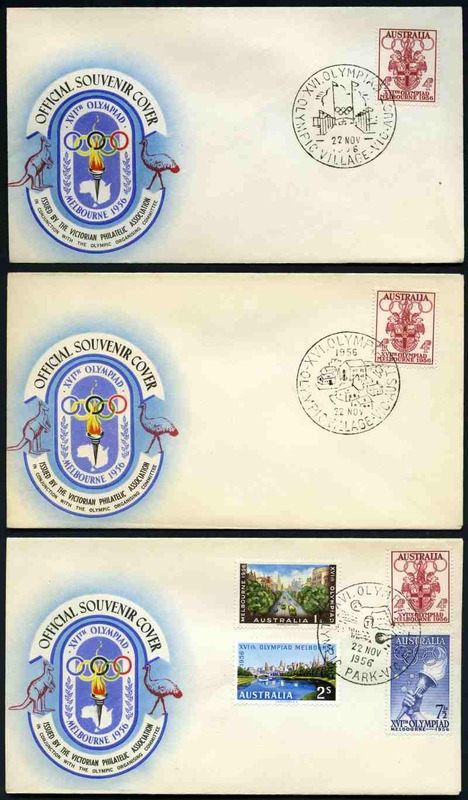 Also Franklin Mint 1977 Silver Jubilee collection of 52 First Day Covers and 1980 The International Olympic Committee collection of 46 FDC's in special album and box. Collection of 581 covers from 1966 to 2008, all cancelled with different special or commemorative postmarks including many illustrated and Australia Post souvenir covers, numerous sets and small range of PSE's. Accumulation of 918 covers from 1966 to 2003, all cancelled with special, relevant or commemorative postmarks, including many illustrated and Australia Post souvenir covers, numerous sets and small range of PSE's and Aerogrammes. Some heavy duplication. 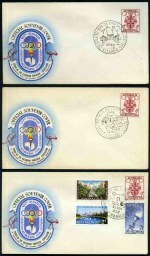 Selection of 76 plain covers from 1973 to 1977, all cancelled with special pictorial postmarks. Good range with odd duplicate. PictorMarks catalogue value $1,762.00.